Reparative hepatocyte replication is impaired in chronic liver disease, contributing to disease progression; however, the underlying mechanism remains elusive. Here, we identify Map3k14 (also known as NIK) and its substrate Chuk (also called IKKα) as unrecognized suppressors of hepatocyte replication. Chronic liver disease is associated with aberrant activation of hepatic NIK pathways. We found that hepatocyte-specific deletion of Map3k14 or Chuk substantially accelerated mouse hepatocyte proliferation and liver regeneration following partial-hepatectomy. Hepatotoxin treatment or high fat diet feeding inhibited the ability of partial-hepatectomy to stimulate hepatocyte replication; remarkably, inactivation of hepatic NIK markedly increased reparative hepatocyte proliferation under these liver disease conditions. Mechanistically, NIK and IKKα suppressed the mitogenic JAK2/STAT3 pathway, thereby inhibiting cell cycle progression. Our data suggest that hepatic NIK and IKKα act as rheostats for liver regeneration by restraining overgrowth. Pathological activation of hepatic NIK or IKKα likely blocks hepatocyte replication, contributing to liver disease progression. The liver is an essential metabolic organ that experiences metabolic stress during fasting, refeeding, and overnutrition states (Rui, 2014). The liver is also responsible for detoxifications of endogenous and exogenous toxic substances, thus being frequently exposed to harmful insults. Dietary hepatotoxins and gut microbiota-derived toxic substances are transported to the liver through the enterohepatic circulation, further increasing risk for liver injury. To compensate for hepatocyte loss, the liver evolves a powerful regenerative ability to maintain its homeostasis (Michalopoulos, 2017). After 70% of partial hepatectomy (PHx), rodents are able to regain normal liver mass within a week via reparative hepatocyte replications (Miyaoka et al., 2012). Nevertheless, hepatocyte proliferation is severely inhibited in chronic liver diseases, including nonalcoholic fatty liver disease (NAFLD), alcoholic liver disease, and chronic exposures to hepatotoxins (Richardson et al., 2007; Inaba et al., 2015; Sancho-Bru et al., 2012; Michalopoulos, 2013). Impairment in hepatocyte replications considerably precipitates liver disease progression; however, the underlying mechanism responsible for defective hepatocyte replications remains poorly understood. In response to liver injury induced by PHx, numerous growth factors and cytokines are secreted and delivered to hepatocytes where they stimulate hepatocyte proliferation by activating multiple mitogenic pathways, including the Janus kinase 2 (JAK2)/STAT3, MAPK, PI 3-kinase, and NF-kB pathways (Michalopoulos, 2017). In contrast, TGFβ1 and interferon-γ inhibit hepatocyte proliferation, thereby preventing liver from overgrowth (Michalopoulos, 2013; Sato et al., 1993; Wu et al., 2015). Liver regeneration is fine-tuned by a balance between positive and negative regulators. We postulated that in chronic liver disease, the negative branch might be predominant and overcome the positive branch, leading to pathological suppression of hepatocyte proliferation and liver regeneration. However, intracellular pathways conferring hepatocyte proliferation inhibition remain elusive. In search for inhibitory pathways, we identified Map3k14, also called NF-kB-inducing kinase (NIK), and its substrate Chuck, also referred to as IkB kinase α (IKKα). NIK is a Ser/Thr kinase known to activate the noncanonical NF-kB2 pathway (Sun, 2012). It phosphorylates and activates IKKα (Xiao et al., 2001). IKKα in turn phosphorylates the precursor of NF-kB2 p100, resulting in generation of the p52 form of NF-kB2 (Sun, 2012; Xiao et al., 2001). Mature p52 is translocated into the nucleus to activate target genes. We previously reported that metabolic stress, oxidative stress, hepatotoxins, and cytokines stimulate hepatic NIK (Sheng et al., 2012; Jiang et al., 2015). Importantly, hepatic NIK is aberrantly activated in both mice and humans with NAFLD or alcoholic liver disease (Sheng et al., 2012; Shen et al., 2014). Hepatocellular stress and liver inflammation, which are associated with chronic liver disease, likely activate hepatic NIK. These observations prompted us to test the hypothesis that hepatic NIK/IKKα pathways cell-autonomously inhibit hepatocyte proliferation. In this work, we characterized hepatocyte-specific NIK (NIKΔhep) and IKKα (IKKαΔhep) knockout mice, and examined reparative hepatocyte replications using PHx models. We found that the NIK/IKKα pathway suppresses reparative hepatocyte proliferation at least in part by inhibiting the JAK2/STAT3 pathway. This work unveils unrecognized crosstalk between the NIK/IKKα and the JAK2/STAT3 pathways involved in regulating liver regeneration. To assess the role of hepatic NIK in reparative hepatocyte proliferation, we performed 70% of PHx on mice at 8 weeks of age following the established protocols (Mitchell and Willenbring, 2008). NIKΔhep mice were generated by crossing Map3k14flox/flox (referred to as NIKf/f) mice with Albumin-Cre drivers (Shen et al., 2017). Proliferating cells were detected by immunostaining liver sections with antibody against Ki67, a cell proliferation marker (Figure 1A). Baseline hepatocyte proliferation rates were low and comparable between NIKΔhep and NIKf/f mice (Figure 1B). Number of liver proliferating Ki67+ cells markedly increased within 48 hr following PHx, and Ki67+ cells were 85% higher in NIKΔhep relative to NIKf/f mice (Figure 1B). In line with these observations, the number of liver BrdU-labelled proliferating cells was also substantially higher in NIKΔhep than in NIKf/f mice (Figure 1C). Liver cell proliferation rates declined in both NIKΔhep and NIKf/f mice after 48 hr post-PHx, and became comparable between these two groups at 96 hr post-PHx (Figure 1B). Hepatocyte-specific ablation of NIK accelerates reparative hepatocyte proliferation. NIKf/f (n = 7) and NIKΔhep (n = 7) male mice (8 weeks) were subjected to PHx, and livers were harvested 48 hr or 96 hr later. (A) Representative immunostaining of liver sections (48 hr after PHx) with anti-Ki67. (B) Ki67+ cells were counted and normalized to total DAPI+ cells. (C) Representative immunostaining of liver sections (48 hr after PHx) with anti-BrdU antibodies. (D–E) Representative images of liver sections (48 hr after PHx) costained with anti-Ki67 and anti-HNF4α antibodies (D) or anti-Ki67 and anti-F4/80 antibodies (E). (F) Ki67+HNF4α+ and Ki67+F4/80+ cells were counted and normalized to total Ki67+ cells. (G) Liver cell death were assessed 48 hr after PHx using TUNEL reagents. (H) Plasma ALT levels. (I) Liver to body weight ratios (n = 8 per group). Data were statistically analyzed with two-tailed Student’s t test, and presented as mean ± SEM. *p<0.05. To verify hepatocytes proliferating, we costained liver sections with anti-Ki67 and anti-HNF4α (a hepatocyte marker) antibodies, or with anti-Ki67 and anti-F4/80 (a Kupffer cell/macrophage marker) antibodies. HNF4α+ hepatocytes accounted for 96% of Ki67+ proliferating cells in NIKΔhep mice at 48 hr post-PHx (Figure 1D,F) while F4/80+ Kupffer cells/macrophages for <4% of Ki67+ cells (Figure 1E,F). These data indicate that hepatic NIK is an intrinsic suppressor of hepatocyte proliferation. We also examined the effect of NIK deficiency on hepatocyte death using TUNEL assays. The number of liver TUNEL+ apoptotic cells was slightly lower in NIKΔhep relative to NIKf/f mice, but the difference was not statistically significant (Figure 1G). Plasma alanine aminotransferase (ALT) activity, a liver injury index, was comparable between NIKΔhep and NIKf/f mice either under basal conditions or after PHx (Figure 1H). Thus, accelerated hepatocyte proliferation cannot be explained by changes in liver injury in NIKΔhep mice. To further confirm the role of hepatic NIK in liver regeneration, we assessed liver to body weight ratios at 2 and 4 days post-PHx. Consistently, liver/body weight ratios were significantly higher in NIKΔhep than in NIKf/f mice at 4 days following PHx (Figure 1I). Of note, liver/body weight ratios were similar between these two groups at 2 days post-PHx. One possible explanation is that a 2 day period may be too short for newly-generated hepatocytes to grow in size large enough to increase liver weight. To determine whether NIK inhibits hepatocyte cell cycle progression, we measured the levels of cyclin D1, which is believed to drive hepatocyte proliferation following PHx (Michalopoulos, 2013). Hepatic cyclin D1 levels were undetectable in both NIKΔhep and NIKf/f mice under basal conditions, and were markedly increased by PHx (Figure 2A). Importantly, hepatic cyclin D1 levels were significantly higher in NIKΔhep than in NIKf/f mice (Figure 2A,B). Collectively, these results support the notion that hepatic NIK may act as an intrinsic rheostat for liver homeostasis by restraining liver overgrowth. Hepatic NIK deficiency upregulates cyclin D1 without altering NF-kB1, Akt, and MAPK pathways in the liver. NIKf/f and NIKΔhep male mice (8 weeks) were subjected to PHx. (A–B) Liver extracts were immunoblotted with anti-cyclin D1 antibody (48 hr after PHx). Cyclin D1 levels were quantified and normalized to α-tubulin levels (NIKf/f: n = 4, NIKΔhep: n = 4). (C) Liver extracts were immunoblotted with the indicated antibodies (4 hr after PHx). (D) Liver ROS levels 48 hr after PHx (normalized to liver weight). NIKf/f: n = 5, NIKΔhep: n = 6. (E) Liver cytokine expression was measured by qPCR and normalized to 36B4 expression (48 hr after PHx). NIKf/f: n = 5, NIKΔhep: n = 5. Data were statistically analyzed with two-tailed Student’s t test, and presented as mean ± SEM. *p<0.05. We next sought to interrogate the molecular mechanism of the NIK action. Expression of liver NIK rapidly increased within 12 hr following PHx, but declined at 3 days post-PHx (Figure 2—figure supplement 1A). Consistently, PHx also increased phosphorylation of liver IKKα/β (Figure 2—figure supplement 1B,C). Interestingly, liver IKKα expression was also increased by PHx (Figure 2—figure supplement 1C). The NF-kB1, MAPK, and PI 3-kinase pathways are known to be involved in mediating PHx-stimulated liver regeneration (Michalopoulos, 2013; Wuestefeld et al., 2013; Pauta et al., 2016). Unexpectedly, phosphorylation of hepatic IkBα, p65 (the NF-kB1 pathway), Akt (pSer473) (the PI 3-kinase pathway), ERK1/2, and JNK (the MAPK pathway) was comparable between NIKΔhep and NIKf/f mice at 4 hr post-PHx (Figure 2C). We also did not detect difference in hepatic levels of reactive oxygen species (ROS) or hepatic expression of cytokines between NIKΔhep and NIKf/f mice (Figure 2D,E). Therefore, NIK suppression of liver regeneration cannot be explained by the above pathways. JAK2 is known to phosphorylate and activate STAT3, which is believed to drive hepatocyte proliferation (Wang et al., 2011; Shi et al., 2017). We postulated that NIK might suppress hepatocyte proliferation by inhibiting the JAK2/STAT3 pathway. Liver extracts were prepared at 4 hr post-PHx and immunoblotted with anti-phospho-JAK2 (pTyr1007/1008) or anti-phospho-STAT3 (pTyr705) antibodies. Phosphorylation of both JAK2 and STAT3 was significantly higher in NIKΔhep mice than in NIKf/f littermates (Figure 3A). Baseline levels of JAK2 and STAT3 phosphorylation in the resected livers were similar between NIKΔhep and NIKf/f mice (Figure 2—figure supplement 1D). NIK inhibits the JAK2/STAT3 pathway. (A) Liver extracts were prepared from NIKf/f and NIKΔhep males 4 hr after PHx and immunoblotted with anti-phospho-JAK2 and anti-phospho-STAT3 antibodies. Phosphorylation of JAK2 (pTyr1007/1008) and STAT3 (pTyr705) was normalized to total JAK2 and STAT3 levels, respectively. (B) STAT3 and JAK2 were coexpressed with or without NIK in HEK293 cells. Cell extracts were immunoblotted with the indicated antibodies. (C) NIK was coexpressed with JAK2 in HEK293 cells. Cell extracts were immunoprecipitated (IP) and immunoblotted with the indicated antibodies. (D) Mouse primary hepatocytes were transduced with NIK or β-gal adenoviral vectors and stimulated with IL6 (10 ng/ml). Cell extracts were immunoblotted with the indicated antibodies. Data were statistically analyzed with two-tailed Student’s t test, and presented as mean ± SEM. *p<0.05. To confirm that NIK directly inhibits the JAK2/STAT3 pathway, we transiently coexpressed JAK2 and STAT3 with NIK in HEK293 cells. In line with our previous reports (Rui and Carter-Su, 1999), overexpressed JAK2 robustly autophosphorylated as well as phosphorylated STAT3 (Figure 3B). Strikingly, overexpression of NIK dramatically decreased tyrosine phosphorylation of both JAK2 and STAT3 (Figure 3B). Consistently, NIK was coimmunoprecipitated with JAK2 (Figure 3C). These data indicate that NIK binds to JAK2 and inhibits JAK2 activity, thereby suppressing the JAK2/STAT3 pathway. Interleukin 6 (IL6) stimulates the JAK2/STAT3 pathway, which is required for reparative hepatocyte proliferation (Riehle et al., 2008; Cressman et al., 1996). These observations prompted us to test if NIK negatively regulates the IL6/JAK2/STAT3 pathway. Mouse primary hepatocytes were transduced with NIK or β-galactosidase (β-gal) adenoviral vectors, followed by IL6 stimulation. IL6 robustly stimulated phosphorylation of STAT3 in β-gal-transduced, but not NIK-transduced, hepatocytes (Figure 3D). Collectively, these results unveil unrecognized crosstalk between NIK pathways and the JAK2/STAT3 pathway. Given that IKKα acts downstream of NIK in the noncanonical NF-kB2 pathway, we reasoned that hepatic IKKα might also suppress liver regeneration. IKKαΔhep mice were generated by crossing Chukflox/flox (referred to as IKKαf/f) mice with albumin-Cre drivers (Liu et al., 2008). We confirmed that IKKα expression was disrupted specifically in the liver but not brain, heart, kidney, skeletal muscle, and spleen in IKKαΔhep mice (Figure 4A). We performed PHx on IKKαf/f and IKKαΔhep male mice at 8–9 weeks of age. The number of liver proliferating Ki67+ cells was significantly higher in IKKαΔhep than in IKKαf/f littermates at both 1 and 2 days post-PHx, and became similar between these two groups after 3 days following PHx (Figure 4B). HNF4α+ hepatocytes accounted for the majority of proliferating cells (Figure 4C). Consistently, liver cyclin D1 levels were significantly higher in IKKαΔhep than in IKKαf/f mice (Figure 4D), while liver cell death was comparable between these two groups (Figure 4E). Consequently, liver to body weight ratios were significantly higher in IKKαΔhep relative to IKKαf/f mice at both 5 and 7 days post-PHx (Figure 4F). Notably, liver/body weight ratios were comparable between these two groups within 3 days following PHx, likely due to lack of sufficient time for hepatocytes to grow their mass as discussed before. These results indicate that deficiency of hepatocyte IKKα, like NIK, also accelerates hepatocyte proliferation and liver regeneration in response to acute liver injury. Ablation of hepatocyte IKKα accelerates hepatocyte reparative proliferation. (A) Tissue extracts were immunoblotted with anti-IKKα or anti-α-tubulin antibodies. (B–F) IKKαf/f (n = 6) and IKKαΔhep (n = 6) male littermates were subjected to PHx, and livers were harvested 48 hr later. (B) Liver sections were immunostained with anti-Ki67 antibody, and Ki67+ cells were counted and normalized to total DAPI+ cells. Day 0 and 1: n = 4 per group; day 3: IKKαf/f: n = 6, IKKαΔhep: n = 8; day 5: IKKαf/f: n = 9, IKKαΔhep: n = 8; day 7: IKKαf/f: n = 6, IKKαΔhep: n = 5. (C) Representative images of liver sections costained with anti-Ki67 and anti-HNF4α antibodies. (D) Liver cyclin D1 was measured by immunoblotting (normalized to α-tubulin levels). (E) TUNEL-positive cells in liver sections. (F) Liver to body weight ratios. Day 0 and 1: n = 4 per group; day 3: IKKαf/f: n = 6, IKKαΔhep: n = 8; day 5: IKKαf/f: n = 9, IKKαΔhep: n = 8; day 7: IKKαf/f: n = 6, IKKαΔhep: n = 5. Data were statistically analyzed with two-tailed Student’s t test, and presented as mean ± SEM. *p<0.05. To gain insight into the molecular mechanism of the IKKα action, we examined the JAK2/STAT3 pathway. 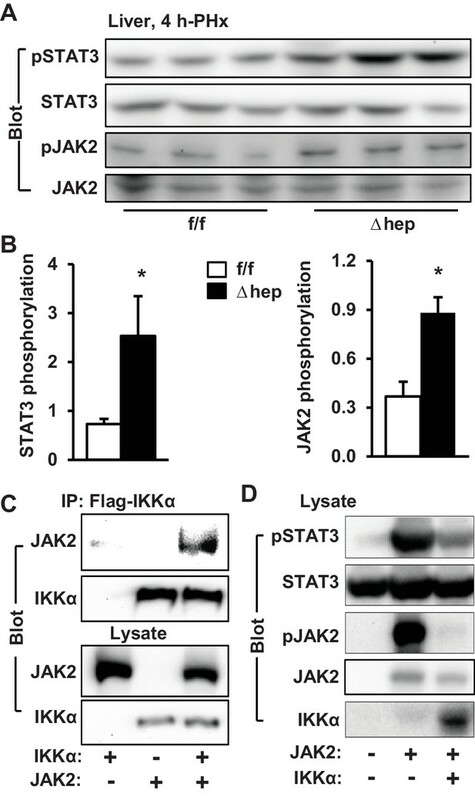 The levels of phosphorylation of JAK2 as well as STAT3 were significantly higher in IKKαΔhep than in IKKαf/f mice at 4 hr post-PHx (Figure 5A,B). We also compared phosphorylation time courses during days 0–7 following PHx. IKKα phosphorylation increased while JAK2 phosphorylation decreasing during days 1–5 (Figure 5—figure supplement 1A,B). This inverse relationship further supports the notion that the NIK/IKKα pathway inhibits the JAK2/STAT3 pathway. Ablation of hepatocyte IKKα increased phosphorylation of JAK2 and STAT3 during days 1–7 following PHx (Figure 5—figure supplement 1B). To confirm that IKKα cell-autonomously inhibits the JAK2/STAT3 pathway, IKKα was transiently coexpressed with JAK2 in HEK293 cells. IKKα was coimmunoprecipitated with JAK2 (Figure 5C), and markedly decreased JAK2 autophosphorylation and the ability of JAK2 to phosphorylate STAT3 (Figure 5D). IKKα inhibits the JAK2/STAT3 pathway. (A–B) Liver extracts were prepared 4 hr after PHx and immunoblotted with anti-phospho-JAK2 and anti-phospho-STAT3 antibodies. Phosphorylation of JAK2 (pTyr1007/1008) and STAT3 (pTyr705) was normalized to total JAK2 and STAT3 levels, respectively. IKKαf/f: n = 6, IKKαΔhep: n = 6. (C) IKKα and JAK2 were coexpressed in HEK293 cells. Cell extracts were immunoprecipitated (IP) and immunoblotted with the indicated antibodies. (D) STAT3 and JAK2 were coexpressed with IKKα in HEK293 cells. Cell extracts were immunoblotted with the indicated antibodies. Data were statistically analyzed with two-tailed Student’s t test, and presented as mean ± SEM. *p<0.05. To determine whether NIK suppresses the JAK2/STAT3 pathway via IKKα, we transduced primary hepatocytes from IKKαΔhep (IKKα-deficient) and IKKαf/f (wild type) mice with NIK or green fluorescent protein (GFP) adenoviral vectors, followed by IL6 stimulation. The ability of NIK to inhibit IL6-stimulated phosphorylation of STAT3 was significantly reduced in IKKα-deficient hepatocytes compared to wild type hepatocytes (Figure 5—figure supplement 1C,D). Of note, NIK overexpression still considerately attenuated STAT3 phosphorylation in IL6-stimulated IKKα-deficient hepatocytes, compared with GFP overexpression (Figure 5—figure supplement 1D). 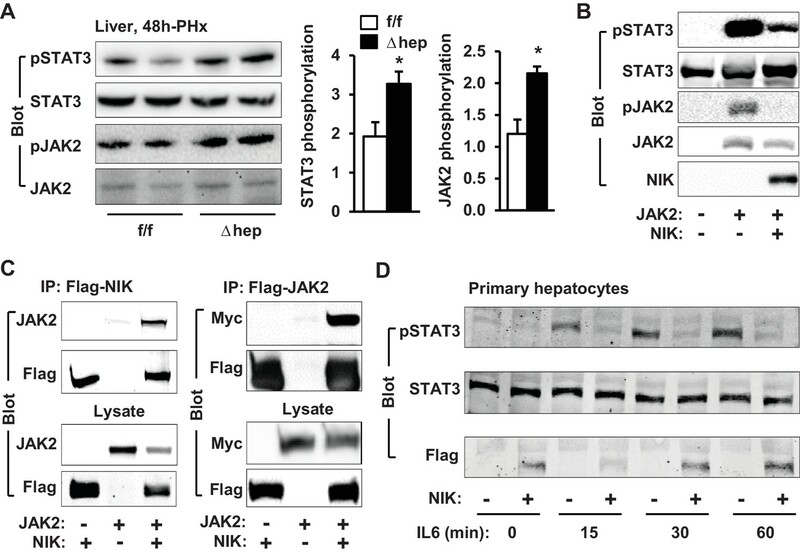 These findings suggest that hepatic NIK suppresses the JAK2/STAT3 pathway, and possibly liver regeneration, by both IKKα-dependent and IKKα-independent mechanisms. Hepatic NIK is highly activated in mice and humans with chronic liver disease (Sheng et al., 2012; Shen et al., 2014), raising the possibility that hepatic NIK might impair liver regeneration in these disease conditions. To model chronic liver disease, we treated NIKΔhep and NIKf/f male mice with 2-acetylaminofluorene (AAF), a hepatotoxin (Laishes and Rolfe, 1981), for 10 days prior to PHx. Liver cell proliferation was assessed at 48 hr post-PHx. AAF treatment considerably increased hepatic levels of NF-kB2 p52 in wild type mice, indicative of NIK activation (Figure 6A). Baseline levels of proliferating Ki67+ hepatocytes in the resected liver (<2%) were comparable between NIKf/f and NIKΔhep mice (Figure 6B). PHx markedly increased hepatocyte proliferation rates in NIKf/f mice, which was substantially inhibited by AAF pretreatment (Figure 6C,D). Remarkably, the number of Ki67+ hepatocytes was significantly higher in NIKΔhep relative to NIKf/f littermates following AAF and PHx treatments (Figure 6C,D). Liver to body weigh ratios were slightly higher in NIKΔhep relative to NIKf/f mice at 2 days post-PHx, but not statistically different (Figure 6—figure supplement 1A). As discussed above, a 2 day period may be too short for newly-generated hepatocytes to grow in size to significantly increase liver weight. Plasma ALT levels were also similar between NIKf/f and NIKΔhep mice (Figure 6E). 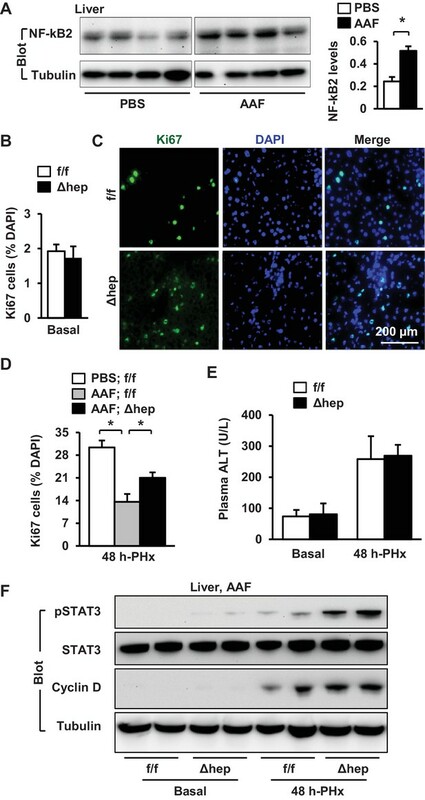 Ablation of hepatocyte NIK reverses AAF-induced impairment in hepatocyte reparative proliferation. (A) C57BL/6 males (8 weeks) were treated with PBS or AAF (10 mg/kg body weight, gavage) daily for 10 days. NF-kB2 p52 in liver extracts was immunoblotted with anti-NF-kB2 antibody (normalized to α-tubulin levels). PBS: n = 4, AAF: n = 4. (B–G) NIKf/f and NIKΔhep males were treated with PBS or AAF (10 mg/kg body weight) for 10 days and then subjected to PHx. Livers were harvested 48 hr later. (B) Baseline Ki67+ cell number in resected liver sections obtained from PHx. NIKf/f: n = 5, NIKΔhep: n = 4. (C) Representative immunostaining of liver sections (AAF-treated) with anti-Ki67 antibody. (D) Ki67+ cell number in liver sections (normalized to DAPI+ cells). PBS;NIKf/f: n = 3, AAF;NIKf/f: n = 5, AAF;NIKΔhep: n = 5. (E) Plasma ALT levels. NIKf/f: n = 3, NIKΔhep: n = 4. (F) Liver extracts were immunoblotted with the indicated antibodies. Data were statistically analyzed with two-tailed Student’s t test, and presented as mean ± SEM. *p<0.05. We next examined cell signaling that drives cell cycle progression. We detected baseline levels of phosphorylation of hepatic STAT3 in NIKΔhep but not NIKf/f mice after AAF pretreatment (Figure 6F). PHx stimulated STAT3 phosphorylation in both NIKΔhep and NIKf/f mice, but to a substantially higher level in NIKΔhep mice (Figure 6F). Baseline hepatic cyclin D1 levels were undetectable in both NIKΔhep and NIKf/f mice pretreated with AAF, and PHx increased cyclin D1 levels to a higher extent in NIKΔhep than in NIKf/f mice (Figure 6F). Together, these data support the notion that abnormal activation of hepatic NIK contributes to hepatotoxin-induced impairment in liver regeneration. NAFLD is associated with both arrest of hepatocyte proliferation and upregulation of hepatic NIK (Richardson et al., 2007; Inaba et al., 2015; Sheng et al., 2012; Shen et al., 2014; Collin de l'Hortet et al., 2014), prompting us to test if elevated hepatic NIK is responsible for impairment in liver regeneration under the disease conditions. To model NAFLD, we placed NIKΔhep and NIKf/f mice on a high fat diet (HFD) for 10 weeks. Both NIKΔhep and NIKf/f mice similarly developed liver steatosis, as assessed by liver triacylglycerol (TAG) levels (Figure 7A). 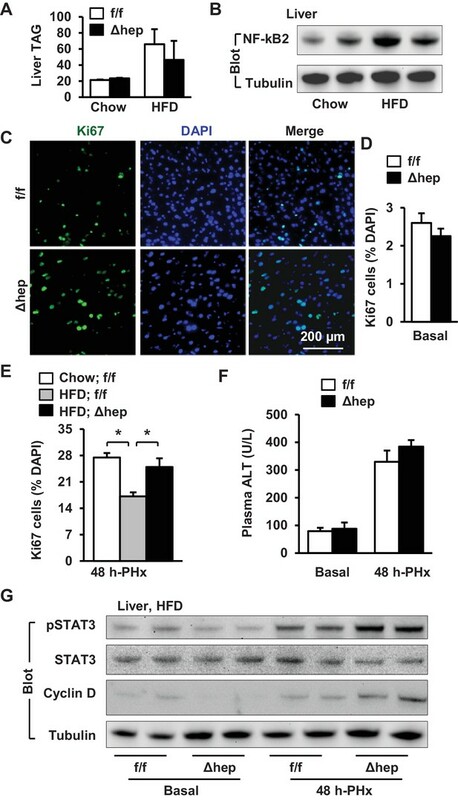 HFD feeding increased hepatic NF-kB2 p52 levels, indicative of NIK activation (Figure 7B). To assess liver regeneration, we performed PHx after HFD feeding for 10 weeks. Hepatocyte proliferation was assessed at 48 hr post-PHx by staining liver sections with anti-Ki67 antibody (Figure 7C). Baseline levels of hepatocyte proliferation in the resected liver were comparable between NIKΔhep and NIKf/f mice (Figure 7D). PHx markedly increased hepatocyte proliferation in chow-fed NIKf/f mice, which was substantially inhibited by HFD feeding (Figure 7E). Importantly, number of proliferating Ki67+ hepatocytes was significantly higher in NIKΔhep than in NIKf/f littermates after HFD feeding (Figure 7E). Liver/body weight ratios were slightly higher in NIKΔhep relative to NIKf/f mice at 2 days post-PHx, but not statistically different (Figure 6—figure supplement 1B). This modest difference can be explained by the short duration that limits the capacity of newly-generated hepatocytes to significantly grow in size and increase liver weight. Plasma ALT levels were comparable between NIKΔhep and NIKf/f littermates under both basal and PHx conditions (Figure 7F). Hepatic NIK deficiency corrects impaired hepatocyte reparative proliferation in mice with NAFLD. (A–B) C57BL/6 males (8 weeks) were fed a normal chow diet (n = 5) or a HFD (n = 5) for 10 weeks. (A) Liver TAG levels (normalized to liver weight). (B) NF-kB2 p52 in liver extracts was immunoblotted with anti-NF-kB2 antibody (normalized to α-tubulin levels). (C–H) NIKf/f and NIKΔhep males were fed a HFD for 10 weeks followed by PHx, and livers were harvested 48 hr after PHx. (C) Representative immunostaining of liver sections with anti-Ki67 antibody. (D) Baseline Ki67+ cell number in resected liver sections obtained from PHx. NIKf/f: n = 4, NIKΔhep: n = 4. (E) Liver Ki67+ cell number (normalized to DAPI+ cells). Chow;NIKf/f: n = 3, HFD;NIKf/f: n = 5, HFD; NIKΔhep: n = 4. (F) Plasma ALT levels. NIKf/f: n = 3, NIKΔhep: n = 4. (G) Liver extracts were immunoblotted with the indicated antibodies. Data were statistically analyzed with two-tailed Student’s t test, and presented as mean ± SEM. *p<0.05. We further explored liver mitogenic pathways in these mice. Baseline STAT3 phosphorylation levels in the resected liver were similar between NIKΔhep and NIKf/f mice fed HFD; however, liver STAT3 phosphorylation increased to a considerably higher level in NIKΔhep relative to NIKf/f mice at 48 hr post-PHx (Figure 7G). Hepatic cyclin D1 levels were also higher in NIKΔhep than in NIKf/f mice post-PHx (Figure 7G). These data suggest that aberrant activation of hepatic NIK suppresses hepatocyte proliferation and liver regeneration in NAFLD at least in part by inhibiting the JAK2/STAT3 pathway. Reparative hepatocyte proliferation plays a pivotal role in the maintenance of liver homeostasis and integrity by supplying new hepatocytes to replace lost ones. Liver regeneration impairment is likely involved in chronic liver disease. In this work, we identified hepatic NIK and IKKα as unrecognized suppressors of liver regeneration; moreover, NIK inhibits hepatocyte proliferation at least in part by activating IKKα. We previously demonstrated that hepatic NIK is aberrantly activated in mice and humans with chronic liver disease (Sheng et al., 2012; Shen et al., 2014). Our current results show that elevated activation of hepatic NIK pathways impairs liver regeneration, likely contributing to liver disease progression. We found that hepatocyte-specific ablation of NIK or IKKα substantially increases hepatocyte proliferation in NIKΔhep or IKKαΔhep mice following PHx. Accordingly, liver regeneration rates were higher both in NIKΔhep relative to NIKf/f littermates and in IKKαΔhep relative to IKKαf/f mice. We observed that both NIK and IKKα bound to JAK2 and substantially inhibited the ability of JAK2 to phosphorylate STAT3. Consistently, hepatocyte-specific ablation of either NIK or IKKα substantially increased phosphorylation of hepatic JAK2 and STAT3 in mice post-PHx. IKKα deficiency decreased the ability of NIK to suppress the JAK2/STAT3 pathway in hepatocytes, confirming that IKKα acts downstream of NIK. However, NIK overexpression still inhibited the JAK2/STAT3 pathway in IKKα-deficient hepatocytes, suggesting that hepatic NIK is able to suppress the JAK2/STAT3 pathway by an additional IKKα-independent mechanism. The JAK2/STAT3 pathway is known to drive hepatocyte proliferation, which is indispensable for liver regeneration (Wang et al., 2011; Shi et al., 2017; Riehle et al., 2008; Cressman et al., 1996). Therefore, hepatic NIK and IKKα inhibit liver regeneration at least in part by suppressing the JAK2/STAT3 pathway. Mounting evidence shows that hepatic NIK is aberrantly activated in chronic liver disease, likely due to liver inflammation and hepatocellular stress (Sheng et al., 2012; Shen et al., 2014). We modeled chronic liver disease by chronically treating mice with hepatotoxin AAF or placing them on HFD. We found that hepatocyte-specific inactivation of NIK substantially increases the ability of PHx to stimulate hepatocyte proliferation in both AAF-treated mice and HFD-fed NIKΔhep mice. Consistently, in mice pretreated with AAF or HFD, ablation of hepatic NIK increased phosphorylation of both hepatic JAK2 and STAT3 post-PHx. It is worth mentioning that NIK in nonparenchymal cells (e.g. immune cells) also contributes to obesity-associated liver steatosis (Liu et al., 2017). These observations raise the possibility that in chronic liver disease, NIK in Kupffer cells/macrophages, and possibly other nonparenchymal cells, may indirectly inhibit reparative hepatocyte replication by a paracrine mechanism. Collectively, our results provide proof of concept evidence supporting the notion that aberrant hepatic NIK impairs reparative hepatocyte replication, thereby contributing to liver disease progression. In conclusion, we have identified hepatic NIK and IKKα as unrecognized suppressors of reparative hepatocyte replication. NIK and IKKα suppress liver regeneration at least in part by inhibiting the hepatic JAK2/STAT3 pathway. Our findings suggest that pharmacological inhibition of hepatic NIK or IKKα may provide a new therapeutic strategy for liver disease treatment. Antibodies were described in the key resources table. Animal experiments were conducted following the protocols approved by the University of Michigan Institutional Animal Care and Use Committee (IACUC). We generated NIKf/f, NIKΔhep, and IKKαΔhep mice (C57BL/6 background). IKKαf/f mice (C57BL/6 background) were provided by Dr. Yinling Hu (the Inflammation and Tumorigenesis Section, National Cancer Institute). Albumin-Cre mice (C57BL/6 background) were from the Jackson laboratory (Bar Harbor, ME). Mice were housed on a 12 hr light-dark cycle and fed a normal chow diet (9% fat; Lab Diet, St. Louis, MO) or a HFD (60% fat in calories; D12492, Research Diets, New Brunswick, NJ) ad libitum with free access to water. We followed published 2/3 PHx protocols (Mitchell and Willenbring, 2008). Briefly, NIKf/f, NIKΔhep, IKKαf/f, and IKKαΔhep male mice (8–10 wks,) were anesthetized with isoflurane, followed by a ventral midline incision. The median and left lateral lobes (70% of the liver) were resected by pedicle ligations. Mice were euthanized after PHx, and tissues were harvested for histological and biochemical analyses. Mice were introperitoneally injected, 12 hr before euthanization, with BrdU (40 mg/kg body weight, ip) to label proliferating cells. A separate cohort was fed a HFD for 10 weeks prior to PHx. An additional cohort was treated with hepatotoxin 2-acetylaminofluorene (AAF) (10 mg/kg body weight, gavage) daily for 10 days prior to PHx. Liver frozen sections were prepared using a Leica cryostat (Leica Biosystems Nussloch GmbH, Nussloch, Germany), fixed in 4% paraformaldehyde for 30 min, blocked for 3 hr with 5% normal goat serum (Life Technologies) supplemented with 1% BSA, and incubated with the indicated antibodies at 4°C overnight. The sections were incubated with Cy2 or Cy3-conjugated secondary antibodies. Primary hepatocytes were prepared from mouse liver using type II collagenase (Worthington Biochem, Lakewood, NJ) and grown on William’s medium E (Sigma) supplemented with 2% FBS, 100 units ml−1 penicillin, and 100 µg ml−1 streptomycin, and infected with adenoviruses as described previously (Zhou et al., 2009). HEK293 cells were grown at 37°C in 5% CO2 in DMEM supplemented with 25 mM glucose, 100 U ml−1 penicillin, 100 µg ml−1 streptomycin, and 8% calf serum. For transient transfection, cells were split 16–20 hr before transfection. Expression plasmids were mixed with polyethylenimine (Sigma, St. Louis, MO) and introduced into cells. The total amount of plasmids was maintained constant by adding empty vectors. Cells were harvested 48 hr after transfection for biochemical analyses. Cells or tissues were homogenized in a L-RIPA lysis buffer (50 mm Tris, pH 7.5, 1% Nonidet P-40, 150 mm NaCl, 2 mm EGTA, 1 mm Na3VO4, 100 mm NaF, 10 mm Na4P2O7, 1 mm benzamidine, 10 μg ml−1 aprotinin, 10 μg ml−1 leupeptin, 1 mm phenylmethylsulfonyl fluoride). Tissue samples were homogenized in lysis buffer (50 mM Tris, pH 7.5, 1% Nonidet P-40, 150 mM NaCl, 2 mM EGTA, 1 mM Na3VO4, 100 mM NaF, 10 mM Na4P2O7, 1 mM benzamidine, 10 µg/ml aprotinin, 10 µg/ml leupeptin; 1 mM phenylmethylsulfonyl fluoride). Proteins were separated by SDS-PAGE and immunoblotted with the indicated antibodies. Total RNAs were extracted using TRIzol reagents (Life technologies). Relative mRNA abundance of different genes was measured using SYBR Green PCR Master Mix (Life Technologies, 4367659). Liver lysates were mixed with a dichlorofluorescein diacetate fluorescent (DCF, Sigma, D6883) probe (5 µM) for 1 hr at 37°C. DCF fluorescence was measured using a BioTek Synergy 2 Multi-Mode Microplate Reader (485 nm excitation and 527 nm emission). Data were presented as means ± sem. Differences between two groups were analyzed using two-tailed Student’s t tests. p<0.05 was considered statistically significant. Journal of Biological Chemistry 290:11704–11714. The Journal of Experimental Medicine 205:91–103. Journal of Biological Chemistry 292:3789–3799. International Journal of Biological Sciences 7:536–550. Journal of Biological Chemistry 284:11152–11159. Thank you for submitting your article "Hepatic NF-κB-inducing Kinase (NIK) Suppresses Liver Regeneration in Chronic Liver Disease" for consideration by eLife. Your article has been reviewed by three peer reviewers, including Hao Zhu as the Reviewing Editor and Reviewer #1, and the evaluation has been overseen by Sean Morrison as the Senior Editor. It is thought that NF-κB promotes inflammation and hepatocyte survival secondary to liver insults. That said, the effects of NF-κB on liver biology can depend on the cell type and the degree of NF-κB activation or inhibition, thus this is a complex but important area of study. It is somewhat surprising but clearly demonstrated in this manuscript that NIK, a kinase that is known to activate the non-canonical NF-κB pathway, is a suppressor of hepatocyte proliferation in both acute and chronic settings. The results presented in this manuscript are generally well performed and clearly presented, but additional experiments are needed to more rigorously support the conclusions of the paper. The genetic models support the notion that NIK-IKKα are negative regulators of hepatocyte proliferation in liver regeneration after partial hepatectomy and other injuries. However, some of the regeneration assays need to be more thoroughly performed and the epistatic relationships between NIK, IKKα, and JAK-Stat should be further elucidated. If these can be added to further support the conclusions of the paper, this story would add additional insight and nuance into traditional perspectives on the influence of NF-κB in liver disease. 1) Both reviewers 1 and 2 asked about the expression pattern of NIK in liver regeneration. Authors should provide a more detailed analysis of NIK before and after PHx (1 day, 2 day, 3 day, 5 day, 7 day) in wild-type mice. This would tell us whether or not expression of this gene is dynamically regulated during regeneration. It would also be nice if NIK expression before and after chronic injury in human livers could be more clearly shown or referenced. 2) The analysis of how loss of NIK affects liver regeneration should be more carefully performed. Authors should show a more detailed time course analysis on days 1, 2, 3, 5, and 7 to establish how NIK accelerates liver regeneration after PHx. Liver/body ratios should be reported for each time point. An analysis of Ki-67 at different time points would also provide a more complete picture of how and when NIK loss induces hepatocyte proliferation. In Figure 1 and in Figure 6, 7, The liver mass to body mass ratios should be reported for the pre-surgery mice, the resected liver pieces, and for the post-resection livers. This would represent the standard and more comprehensive way for how PHx liver regeneration phenotypes are generally characterized. 3) A more thorough protein expression analysis along the regeneration time course would help to illustrate how the major targets of NIK (JAK2, p-JAK2, STAT3, p-STAT3, IKKα) are affected in control and NIK KO mice. These expression studies should be performed in the same liver samples and multiple time points so as to help clarify the epistatic relationships in this signaling cascade. 4) The authors clearly show that IKKα deletion phenocopies NIK deletion, which suggests that IKKα is downstream of NIK. However in Figure 2, the authors claimed that phosphorylation of IKKα/β, IkBα, and p65 is not affected in NIK knockout mice compared to NIK floxed mice, therefore concluding that NF-κB pathway does not mediate the suppression of liver regeneration by hepatic NIK. Thus, two reviewers where not confident that the epistatic relationships between NIK, IKK, and Jak/Stat were conclusively established. Although liver-specific KO of NIK and IKKα show similar regeneration phenotypes, there is no data to directly assess the signaling cascade. This could be done by including NIK, p-IKKα and total-IKKα, together with p-STAT3/t-STAT3 and p-JAK/JAK in Western blot analyses in NIK KO, IKKα KO, and WT livers. Along the same lines, the effect of NIK overexpression in IKKα-/- hepatocytes on JAK-STAT3 signaling should be examined to determine whether IKKα is a downstream effector of NIK. To limit the amount of work, this can be done in hepatocytes in vitro only and p-STAT3 can be used as a readout. If the time course signaling analysis within WT mice (comment 3) and these over-expression experiments clearly support the hypothesis that NIK is upstream of IKKα and Jak-stat, then the authors do not need to provide the signaling analysis in each of the different mutant mouse models. 5) The authors have published a paper in Endocrinology 2017 that states in the Abstract: "deletion of NIK in the liver, including both hepatocytes and immune cells, protected against HFD-induced liver steatosis and attenuated hepatic glucose production. Mechanistically, deletion of liver NIK suppressed liver inflammation and lipogenic programs, thus contributing to protection against liver steatosis." Can the authors discuss potential non-cell-autonomous effects that might accelerate hepatocyte regeneration? No experiments are necessary here, but a clarifying discussion about known cell-type dependent effects of NIK would be helpful to frame the findings in this paper in the context of past studies. 6) It was noted by reviewer 3 that the authors' claim that the described pathway regulates a quality control mechanism to block proliferation of damage hepatocytes is not supported by direct evidence. In fact, serum ALT, the only measurement that indirectly determines liver integrity, did not differ between control and liver NIK-/- mice. Please edit or clarify the manuscript to limit this particular statement. Thank you for resubmitting your work entitled "Hepatic NF-κB-inducing Kinase (NIK) Suppresses Liver Regeneration in Mouse Acute and Chronic Liver Disease" for further consideration at eLife. Your revised article has been evaluated by Sean Morrison (Senior Editor), a Reviewing Editor, and two reviewers. There have been some substantial improvements made during the revisions, especially in regards to the mechanistic relationships within the NIK IKK signalling axis. However, there are some significant concerns about the liver regeneration phenotypes that we would like you to clarify before we make a decision on this manuscript. The liver regeneration data are heavily dependent on precise liver mass measurements in large numbers of mice at different time points. Liver mass recovery is ultimately the most important physiological readout (not necessarily proliferation) when assessing liver regeneration. With this in mind, the revision reveals significant uncertainty about the central phenotypic findings of the paper. You present a method of calculation of "liver growth rates" during regeneration that is not accurate. You calculate liver growth rate as follows: "Estimation of total liver weight before PHx: resected liver weight ÷ 70%. Calculation of the remnant liver weight after PHx: total liver weight – resected liver weight. Liver weight gains: terminal liver weight – the remnant liver weight. Liver growth rates: liver weight gains normalized to the remnant liver weight after PHx." The 70% number is theoretical, not measured, and each surgery can be different in terms of amount of liver resected and probably ranges from 50-75%. If in actuality less than 70% is resected, then the total liver mass will be substantially mis-calculated and under-estimated. This would be compounded when "liver growth rates" are calculated because the formulation stated above uses several non-measured numbers to calculate the remnant liver weight. This is likely why there is a significant increase in liver growth rates in Figure 1I, while there is no actual difference in liver/body weight ratio at 2 or 4 days as shown in Figure 1—figure supplement 1. The day 4 data does not contain enough mice and the p value does not reach significance. The negative data in this figure supplement is in opposition to Figure 1I, and suggests that there is not a significant effect on liver mass recovery after partial hepatectomy for NIK deleted mice. The IKK data in Figure 4—figure supplement 1 is also confusing, with a significant differences in Ki67 but no strong changes in liver mass until day 7, when liver regeneration is mostly completed. The most rigorous data here are the liver/body weight ratios at days 2 and 4 for both NIK and IKK mice, and both of these sets of data are essentially negative. Again in Figure 6E the same type of data discrepancy exists. In Figure 6E, there is a significant increase in liver growth rates, but then in the supplement there is no significant difference in liver/body weight ratios. All of these points raise the possibility that the phenotyping was not completely solid, and the revision experiments further bring those points to light. We would like to give you another opportunity to clarify the data and to resolve the questions raised above, if you are able to do so. An adequate number of mice to answer the questions would be important in this case. If the key data are indeed negative, or if the conclusions are not strongly supported by a rigorous way of assessing liver mass, then we would encourage you to resubmit this manuscript elsewhere. We conducted the requested experiments and added the new results in the revised Figure 2—figure supplement 1A. Indeed, we observed a transient increase in NIK expression, likely due to increased cytokine secretion and/or hepatocellular stress in response to PHx-induced liver injury. We tried to measure NIK protein levels using commercial anti-NIK antibodies from 3 sources (Santa Cruz sc-8417; Abcom ab191591, CST #4994), but failed to detect hepatic NIK protein. Notably, it is widely known that endogenous NIK levels in most animal tissues are below the detection thresholds of commercial antibodies. We previously reported that liver NIK pathways are aberrantly activated in humans with chronic liver injury induced by alcoholic consumption or autoimmune attack (Hepatology, 60:2065-76, 2014). We cited this work in the revision. We performed the suggested experiments on NIKΔhep mice on day 2, 4, but not after day 4, post-PHx, because we were unable to obtain enough mice. We have encountered difficulty with NIKΔhep breeding colonies, and were unable to expand the colonies. Liver/body weight ratios were higher in NIKΔhep than in NIKf/f mice on day 4 post-PHx (the revised Figure 1—figure supplement 1). As an alternative approach, we conducted the time course analyses of both liver/body weight ratios and Ki-67 cell number on IKKαΔhep mice from day 0 through day 7 following PHx. We found that liver/body ratios were significantly higher in IKKαΔhep than in IKKαf/f mice on day 7 post-PHx (the revised Figure 4—figure supplement 1B). We also assessed the time course of liver Ki67 cells (day 0-7) following PHx (Figure 4—figure supplement 1A). We calculated liver/body ratios for Figures 1, 6 and 7 as suggested, and added resected liver/body ratios and post-resection liver/body ratios in the revised Figure 1—figure supplement 1 and Figure 6—figure supplement 1 (for Figures 6 and 7), respectively. We did not examine liver/body ratios in pre-surgery mice, because we do not have enough mice. Moreover, the results are unlikely to provide, in our view, significant new information, considering the results from the resected livers (resembling pre-surgical conditions). We carried out the requested experiments, and added new data in the revised Figure 2—figure supplement 1B-C (for IKKα) and the revised Figure 5—figure supplement 1A-B (for JAK2 and STAT3). We discussed these experiments in the following response to Question 4. We carried out the requested experiments, and added new data in the revised Figure 2—figure supplement 1B-C (IKKα) and Figure 5—figure supplement 1A-B (JAK2 and STAT3). Phosphorylation of IKKα appeared to precede a decrease in phosphorylation of JAK2 in wild type mice following PHx; deletion of hepatic IKKα largely blocked reduction in JAK2 phosphorylation (Figure 5—figure supplement 1B). These data further support the notion that hepatic IKKα suppresses JAK2 following PHx. We carried out the suggested hepatocyte culture experiments and added new data in the revised Figure 5—figure supplement 1C-D. IKKα deficiency decreased, but not completely blocked, NIK-induced suppression of phosphorylation of STAT3 in response to IL6. These new data further support the original hypothesis that hepatic NIK is able to suppress liver regeneration by both IKKα-dependent and –independent mechanisms. 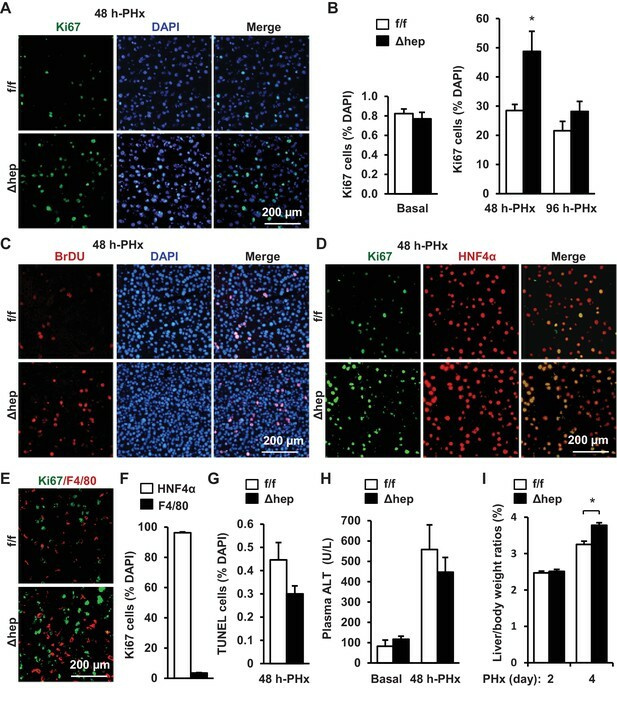 We expanded Discussion as requested, adding “Notably, deletion of hepatocyte NIK increased phosphorylation of hepatic JAK2 and STAT3 in NIKΔhep mice either treated with AAF or fed a HFD, suggesting that hepatic NIK suppresses hepatocyte replication in part by repressing the JAK2/STAT3 pathway. Notably, NIK activity in nonparenchymal cells, including immune cells, was recently reported to contribute to obesity-associated liver steatosis (27). We propose that in chronic liver disease, NIK pathways in nonparenchymal cells, particularly in Kupffer cells/macrophages, may also inhibit reparative hepatocyte replication indirectly by a paracrine mechanism. Relative contributions of the hepatocyte-autonomous and non-autonomous actions of NIK to liver regeneration should be further studied in the future”. We deleted the quality control-related discussion in revision as suggested. We thank the reviewers and editors for these constructive comments. We deleted the “liver growth rates” data following these comments. We performed additional PHx experiments, increasing animal number at 4 days from 4 to 8 mice per group. Excitingly, we observed that liver/body weight ratios are significantly higher in NIKΔhepthan in NIKf/f mice. We replaced the original Figure 1I with these new results in the revised Figure 1I. Of note, there is no significant difference in liver/body weight ratios at 2 days post-PHx. We reason that a 2-day period is too short for hepatocytes to grow in size to significantly increase liver mass and liver/body weight ratios. In this short initial phase, hepatocytes rapid replicate, but newly-generated hepatocytes are not yet grow in size to increase total liver mass. Hepatocyte hypertrophy likely occurs later, thereby increasing liver weight and liver/body weight ratios at relatively late stages (i.e. >3 days). We provided this explanation in the revised manuscript. We conducted additional PHx experiments, increasing mouse number: day 0 and 1: from 3 to 4 per group; day 3: IKKαf/f: 5 to 6, IKKαΔhep: 5 to 8; day 5: IKKαf/f: 5 to 9, IKKαΔhep: 5 to 8; day 7: IKKαf/f: 5 to 6. We found that liver/body weight ratios are significantly higher in IKKαΔhepthan in IKKαf/fmice at both 5 and 7 days post-PHx. They become higher at 3 days, but not statistically different. We replaced the original Figure 4F (liver growth rates) with these new results in the revised Figure 4F. We also provided an explanation that a short duration of the initial phase (<3 days post-PHx) likely limits the growth of newly-generated hepatocytes, contributing to modest liver/body weight ratio difference at this stage. Again in Figure 6E the same type of data discrepancy exists. In Figure 6E, there is a significant increase in liver growth rates, but then in the supplement there is no significant difference in liver/body weight ratios. We deleted Figure 6E (liver growth rates) following the comments discussed in the Response 1. The liver/body weight ratio experiments were conducted at 2 days post-PHx in both Figures 6 and 7. Based on the above discussions about the revised Figures 1I and 4F, liver/body weight ratios are expected to be comparable between NIKΔhepthan in NIKf/f mice at 2 days, because this short duration limits growth of newly-generated hepatocytes and liver mass. We provide this explanation in the revise manuscript. We thank Drs. Lin Jiang, Liang Sheng, Chengxin Sun, and Lei Yin and Michelle Jin for assistance and discussion. We thank Dr. Yinling Hu (Inflammation and Tumorigenesis Section, National Cancer Institute) for providing us with IKKαf/f mice. This study was supported by grants DK091591, DK115646, DK114220 (to LR) and DK47918 (to MBO) from the National Institutes of Health (NIH), fellowship #2013/07313–4 from São Paulo Research Foundation (FAPESP) (AST), and grant 81420108006 (to YL) from the National Natural Science Foundation of China. This work utilized the cores supported by the Michigan Diabetes Research and Training Center (NIH DK20572), the University of Michigan's Cancer Center (NIH CA46592), the University of Michigan Nathan Shock Center (NIH P30AG013283), and the University of Michigan Gut Peptide Research Center (NIH DK34933). Animal experimentation: This study was performed in strict accordance with the recommendations in the Guide for the Care and Use of Laboratory Animals of the National Institutes of Health. All of the animals were handled according to approved institutional animal care and use committee (IACUC) protocols (PRO00006638) of the University of Michigan. The protocol was approved by the Committee on the Ethics of Animal Experiments of the University of Michigan. © 2018, Xiong et al.